Sisters of St. Francis of the Neumann Communities – women who have devoted their lives to the service of God and the neediest of his people. Here you will find many resources you need to help you tell their important stories. Syracuse, New York, December 13, 2017 – Sister Pat Bergan believes non-violent protesting and civil disobedience are still the best ways to bring about change in the world today. She should know. She’s spent the past 30 years of her life fighting for justice for people who are poor, unwelcomed and for an environment in need of care. She says the media’s extensive coverage of these demonstrations gets the protesters’ messages out to more people. “Protests today are very valuable because the media focuses in on them,” she says. Working for change is “taking part in what you feel called to… it’s being in tune with people, being there to support people,” she says. “Immigration is big and St. Lucy’s is studying sanctuary and what it means to be a sanctuary church,” she says. Editor’s note: In recognition of Sister Pat Bergan’s lifelong commitment to activism, the ArtRage Gallery in Syracuse, New York is featuring her in a photography exhibit entitled “Still the One.” The goal of the exhibition, which honors 27 women activists age 80 and older from central New York, is to share the wisdom of these elders and recognize those who persisted and made a difference. The exhibit runs through January 13, 2018. Williamsville, New York, November 5, 2017 – Seven Sisters of St. Francis of the Neumann Communities celebrated their 70th and 50th anniversaries in religious life on Saturday, Oct. 7. Sisters marking 70 years celebrated a 9 a.m. Mass of Thanksgiving at the chapel of St. Mary of the Angels, the region house; Father John Leising was the celebrant. Those sisters commemorating 50 years gathered at 11 a.m. at Sts. Peter & Paul Church with principal celebrant Father Robert W. Wardenski and concelebrants Fathers Paul P. Sabo and Ronald P. Sajdak. A beautiful reflection given by Sister Margaret Carney and liturgical dance offered by Sister Michaeleen Cabral enhanced the liturgy. More than 300 guests attended the two services. Afterwards, at St. Mary of the Angels, the 70 year jubilarians and their guests enjoyed a brunch. A reception for sisters celebrating 50 years followed. Syracuse, New York, November 13, 2017 – Sister Rita Marie Fritzen, OSF, principal of All Saints Academy in Bayonne, New Jersey, accepted the 2017 National Blue Ribbon School award, the highest honor any public or private school can achieve from the U.S. Department of Education during an awards ceremony in Washington, D.C. on Nov. 7. All Saints was one of 342 schools and 50 private schools from across the U.S. and 17 in the state of New Jersey recognized as an Exemplary High Performing School for overall academic performance. In 2016, students in grades three through eight ranked above the 70th percentile in reading, math and language arts. “Our school has a ‘wow’ factor,” said Sister Rita Marie. “The things that we do here make students perform to their academic level.” Sister Rita Marie, a Sister of St. Francis of the Neumann Communities, is in her third year as principal of All Saints. She previously served as associate director of catechesis for Catholic schools in the Archdiocese of Newark, New Jersey. All Saints was founded in 2008 when four Catholic schools in Bayonne combined into one. Students, faculty and staff live out their mission daily: Through ‘Faith, Respect, Service, and Academics,’ All Saints Catholic Academy strives to instill and strengthen a love of faith and ethics in the Catholic tradition, as well as prepare students to be active participants and problem solvers in a global economy. Pittsburgh, PA, June 23, 2017 – As a Sister of St. Francis of the Neumann Communities for 74 years, Sister Elizabeth Zagar of Millvale, Pennsylvania says she feels blessed by the love of her sisters in community. Their support has been instrumental in helping her to live a long and healthy life. On June 28, Sister Elizabeth will celebrate her 100th birthday at the Sisters of St. Francis’ Mount Alvernia convent in Millvale, Pennsylvania. The oldest of eight children, Sister Elizabeth grew up in Aliquippa, Pennsylvania where she entered the Sisters of St. Francis from St. Joseph’s Parish. After earning a master’s degree in education from Duquesne University in 1967, Sister Elizabeth began teaching in the fields of math and science. Sister Elizabeth’s teaching career spanned more than 30 years at elementary, secondary and schools in the Diocese of Pittsburgh, and 13 years in Rio Piedras, Puerto Rico. During her later years, she served as manager at the former St. Francis Plaza senior adult living community in Pittsburgh’s Lawrenceville neighborhood, and in the business office at the former St. Francis Medical Center in Lawrenceville. Today, Sister Elizabeth serves in prayer ministry. She prays regularly throughout the day and attends Mass each day. “I always include people I have met in my lifetime in my daily prayers,” she says. Pittsburgh, Pa., June 21, 2017 – After much prayer and discernment, the Sisters of St. Francis of the Neumann Communities in Millvale have completed a study to determine the best long-term residential plan for sisters in the area and as a result, have decided to sell the Mount Alvernia campus. The property has been listed with Massaro Properties, LLC of Pittsburgh, with Martha L. Graham serving as lead broker. Parties interested in submitting a bid on the property should contact her at 412.963.2800, ext. 236. The sisters in Millvale began the housing study four years ago as part of an overall study of housing needs in all the congregation’s regions: Pittsburgh; Honolulu, Hawaii; Mount Vernon, Buffalo and Syracuse, New York. “We are committed to stewarding our resources wisely and using those resources in ways that are consistent with our values,” said Sister Barbara Jean. “We don’t know how long it will take to find housing that allows sisters to remain independent for as long as possible, but also offers them peace of mind if a health issue arises,” said Rochelle Cassella, congregational director of communications. In 1865, the Sisters of St. Francis arrived in Pittsburgh, establishing St. Francis Hospital in Lawrenceville. 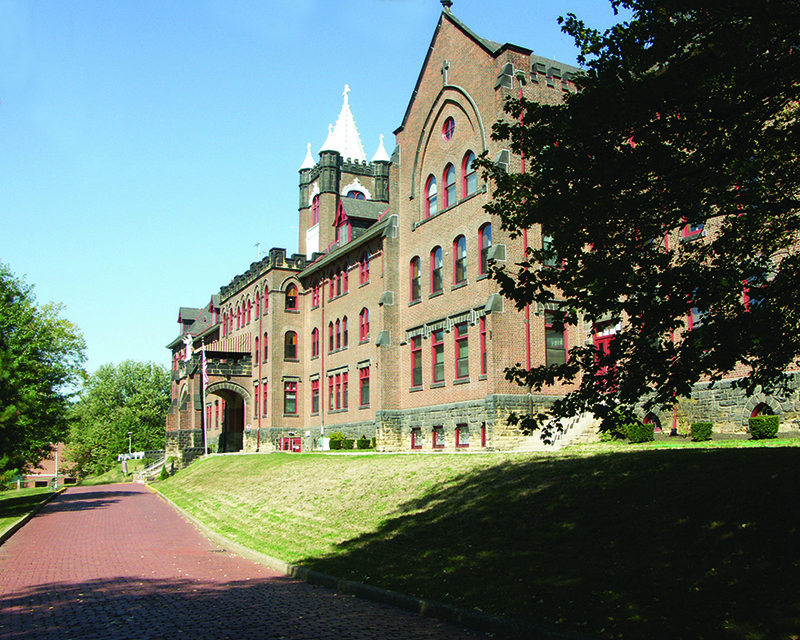 In 1900 as their numbers continued to increase, a new convent was built atop Mount Alvernia to accommodate 350 sisters. In 2007, the sisters in Millvale merged with the Syracuse, New York based Sisters of St. Francis of the Neumann Communities. Today, 68 sisters call Mount Alvernia home; while many are retired, others continue serving in health care, education and social service ministries. The Sisters of St. Francis of the Neumann Communities is a congregation of 387 vowed women religious whose origin goes back to St. Francis of Assisi in the 13th century. Our Franciscan spirit, rooted in the Gospel, motivates us to continue God’s work and respond to God’s people wherever there is a need with reverence, justice and compassion. Together, the sisters serve in 12 states, the District of Columbia, the Commonwealth of Puerto Rico, as well as in Kenya and Peru. Sister Beth Niederpruem has seen her workload at Vive in Buffalo more than double in the weeks following the release of new U.S. policies for immigration. Refugees seeking asylum have overwhelmed the safe house in their efforts to cross over into Canada. “We currently have between 30 and 40 people more than we can handle at Vive,” said Sister Beth. “We’ve been housing them in parishes and wherever we can find them places to stay.” Some of those at Vive have been in the U.S. for a long time while others have just arrived. “Everybody is fleeing the country now and we’re coping with the crisis,” said Sister Beth. She noted that while many of Vive’s current residents are looking to get into Canada, “many of them don’t have the credentials. We just had one large family here from Haiti who couldn’t meet the requirements for Canada and they left. I don’t know where they’ve gone or what’s going to happen to them,” she said. Another complication is the makeup of some of the families. “Right now we have two families of 10 people. One family is from Somalia and the other is from Guatemala. Both families are a mix in that some of the children were born abroad and some of the children were born here in the U.S. That’s really a mess,” she said. As she spoke, Sister Beth was driving a van loaded with pots and pans to one of the temporary housing sites. The refugee center is in desperate need of sheets and blankets for single beds as well as pillows, towels and travel accessories, as it is unlikely the flow of people will slow any time soon. Photo caption: Muwahi Robson and Sister Beth Niederpruem pick up supplies at St. Mary of the Angels in Williamsville, New York where sisters and Franciscan associates generously pooled their resources in support of refugees. Sister Margaret Carney of the Sisters of St. Francis of the Neumann Communities is being honored for her many contributions to Catholic intellectual life. She will receive the Monika K. Hellwig Award from the Association of Catholic Colleges and Universities at the association’s annual meeting Jan. 28 in Washington, D.C. Prior to being named the 20th president of St. Bonaventure University (Olean, New York) in 2004, Sister Margaret held positions at the university including associate professor of Franciscan Studies, dean of the School of Franciscan Studies and director of the internationally recognized Franciscan Institute. During her term as the Institute’s dean and director she helped found the Bonaventure Texts in Translation Series. She worked with Joseph Chinnici, OFM, of the Franciscan School of Theology (California) and Brother Ed Coughlin, OFM, currently president of Siena College to help establish the Secretariat for the Franciscan Intellectual Tradition, which offers consulting for study centers, publishers and individual scholars of the Franciscan Order. She resigned from the presidency of St. Bonaventure in 2016 but continues to participate in designated initiatives for the university. Sister Margaret’s early work included years in elementary and secondary education and ministries within the Franciscan community. As associate vicar for religious in the Diocese of Pittsburgh, she was the first woman to serve in that diocese’s chancery; she lectured extensively in the U.S. and abroad in Franciscan studies; and was a member of the working commission of the Franciscan Third Order Regular mandated with drafting a new formulation of the Rule and Life for more than 400 congregations of Franciscan sisters and brothers. Sister Margaret holds a master’s degree in theology from Duquesne University, a graduate degree in Franciscan Studies from St. Bonaventure University and became the first woman to earn a doctorate in theology at the Antonianum, Rome’s Franciscan University. The Association of Catholic Colleges and Universities was founded in 1899 and serves as the collective voice of U.S. Catholic higher education. Through programs and services, the association strengthens and promotes the Catholic identity and mission of its member institutions so that all associated with Catholic higher education can contribute to the greater good of the world and the Church. For more than 40 years, Sister Ann Carville, Ph.D., has been concerned about the care of elderly vowed religious, not just in her own congregation but in other religious communities as well. She worked with international and national communities as they planned for the care of their senior members, advising them to take advantage of government programs and to transform their sick and infirm convent areas into hospital care units, hiring caregivers for various levels of care. She now serves as an elder care consultant for the National Religious Retirement Office (NRRO). Her compassionate concern for senior religious and contributions in retirement planning for them has earned her the recognition of the Sisters of Sts. Cyril and Methodius, who recently awarded Sister Ann with the Father Jankola Lifetime Commitment to Servant Leadership Award. Sister Alicia Damien Lau has pledged to remain at Kalaupapa until the last patient with Hansen’s disease leaves the island. She first came to Molokai in 1965, the year she entered her community when nearly 200 patients were still under quarantine and forbidden to leave the island. Today, seven patients remain. St. Marianne Cope is Sister Alicia’s inspiration. “When I look at the wonderful things St. Marianne did with the people of Kalaupapa, and her commitment to love them unconditionally, it’s my way of continuing in her footsteps,” she says. In honor of her many works of love at Kalaupapa, The Military and Hospitaller Order of Saint Lazarus of Jerusalem – Grand Priory of America awarded Sister Alicia the Companionate of Merit Award during the group’s investiture ceremony in Charleston, South Carolina on Oct. 29. The primary mission of The Military and Hospitaller Order of Saint Lazarus of Jerusalem – Grand Priory of America is to create awareness and educate people about programs designed to combat Hansen’s disease. The group also works to promote organ donation programs. by email as soon as it is available.